We loved holding our first ‘Demo Day’ last year so much, we’re repeating it for 2019! ‘Save the Date’ – Sunday 5 May! We’ll have a greater variety of bikes for you to check out and test this year. A range of brands will be available such as Genesis, Ridgeback, Saracen, Merida, Haibike, Tifosi, Dawes and Squish kids’ bikes. Road, mountain bikes, ebikes, leisure or commuting there will be bikes to whet your appetite. Cyclocross and gravel bikes will feature too, as well as bikes for all the family. Even Toddlebikes designed for the littlest of the new generation of cyclists. ‘Demo Day’ attendees can enjoy a spot of breakfast or brunch with our compliments from the on-site catering which will be serving food and refreshments during the day. Whether you’re a seasoned cyclist or just starting out, drop by for a chat, test ride and a great day out! 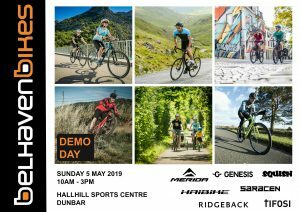 ‘Demo Day’ Sunday 5 May 2019, 10am-3pm, Hallhill Sports Centre, Dunbar, East Lothian EH42 1RF. (on-site catering and bar available for food and refreshments during the day). And if you fancy a total weekend of cycling celebrations drop by the shop on Saturday 4 May 2019 for ‘Local Bike Shop Day’ 2019. Check out our News item for all the details. *Vouchers can be collected at the ‘Demo Day’ by attendees and exchanged at Hallhill Sports Centre for a hot or cold drink (non-alcoholic) together with a hot or cold breakfast/brunch roll. One voucher per person.